Pure Land Buddhism (Chinese: 净土宗, Jìngtǔzōng; Japanese: 浄土宗, Jōdoshū; Korean: 정토종, Jung To Jong; Vietnamese: Tịnh Độ Tông), also known as Amidism, is a branch of Mahayana Buddhism and currently one of the dominant schools of Buddhism in East Asia. 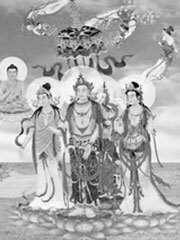 It is the devotional or «faith»-oriented school of Buddhism, emphasizing rituals, and has become the mainstream branch of Mahayana Buddhism as a whole. Less practiced schools in Mahayana include Chan (Zen in Japan) and Yuzu Nembutsu. In China, Pure Land and Chan are often practised concurrently. The Pure Land school first became prominent with the founding of a monastery upon the top of Mount Lushan by Hui-yuan in 402. It spread throughout China quickly and was systematized by Shan-tao (613-681). The philosophy spread to Japan and slowly grew in prominence. Honen Shonin (1133-1212) established Pure Land Buddhism as an independent sect in Japan, known as Jodo Shu. Today Pure Land is the dominant form of Buddhism in China, Japan, Taiwan, and Vietnam. Contemporary Pure Land traditions see the Buddha Amitabha preaching the Dharma in his buddha-field (sa. buddhakṣetra), called the «Pure Land» (zh. 净土, pinyin jìngtǔ, jp. 浄土 jodo, vi. Tịnh độ) or «Western Pureland» (zh. 西天), a region offering respite from karmic transmigration. The Vietnamese also use the term Tây Phương Cực Lạc (西方极乐) for «Western Land of Bliss», or more accurately, «Western Paradise». In such traditions, entering the Pure Land is popularly perceived as equivalent to the attainment of nirvana. Adherents believe that without assistance, demonic possession and wandering from the path are likely over the course of multiple rebirths. Thus, adherents believe that the Buddha provided an easier route to enlightenment, the Pure Land. The main idea behind Pure Land Buddhism is that nirvana is difficult to obtain without the assistance of the Buddha. Instead of solitary meditative work toward enlightenment, Pure Land Buddhism teaches that devotion to Amitabha will lead us to the Pure Land (reminiscent of Heaven) from which Nirvana will be easier to attain. Some Pure Land Buddhists have taught that in order for a devotee to be reborn in Amitabha’s Western Paradise or Western Pureland, they should chant or repeat a mantra or prayer to Amitabha as often as possible to reinforce a proper and sincere state of mind (ex: Chinese 南無阿弥陀佛 Nàmó Āmítuó fó; Japanese Namu Amida butsu; Korean 나무아미타불 Nahmuamitahbool Vietnamese Nam-mô A-di-đà Phật). It is believed, that if practitioners chant Amitabha Buddha’s name continuously, when their current life comes to an end they can be received with their karma by Amitabha Buddha (帶業往生). This fairly simple form of veneration has contributed greatly to its popularity, especially in Japan. Nianfo, or the ritualistic chanting of the Buddha’s name, is a part of some forms of Pure Land Buddhism. In esoteric Vajrayana Buddhism, Amitabha’s Western Pure Land is the counterpart to Akshobhya’s Eastern Pure Land, or Abhirati. While especially recognized by the Japanese Shingon sect, Eastern Pure Land Buddhism is less popular than in Western Pure Land Buddhism.